« Whiter skin in just 14 days! Here’s some photos relevent to my previous posts. 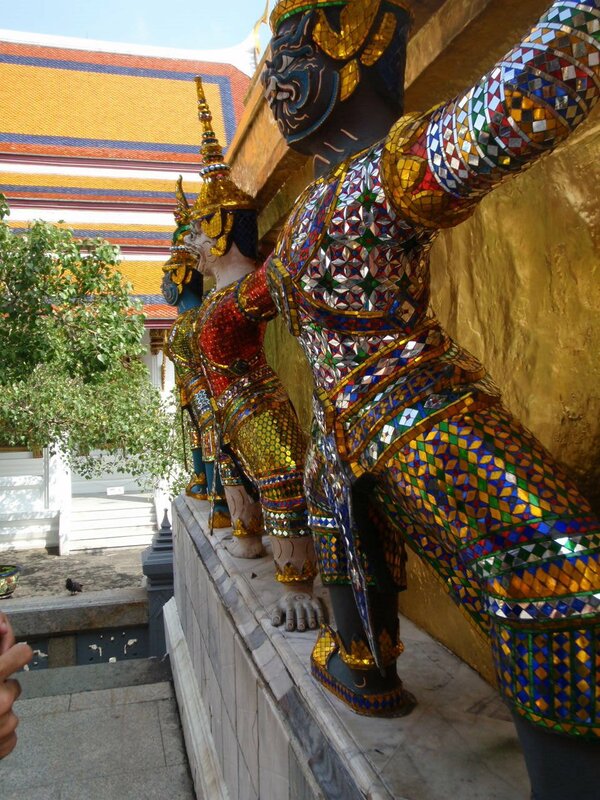 My favourite part of the Grand Palace – the demons and the monkeys. (The monkeys are barefoot). Everything you see that looks like it might be made of gold or gold leaf – it is. It’s been a crazy few days since I last wrote. As expected, elephant trekking and bamboo rafting was a fantastic experience. 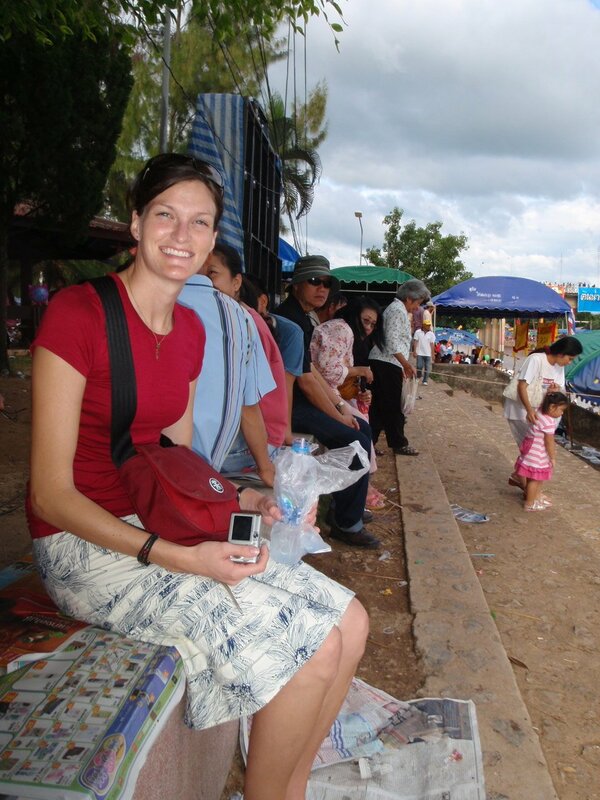 I highly recommend Kanchanaburi if you are ever in Thailand, it’s beautiful, and there’s a lot that I didn’t see, so I’m hoping to find time to return. Kwai, which apparently is really famous thanks to a movie that was made with the same title. If you’ve heard of it, sorry to let you down in the movie culture side of things. I guess I haven’t seen as many films as I thought! 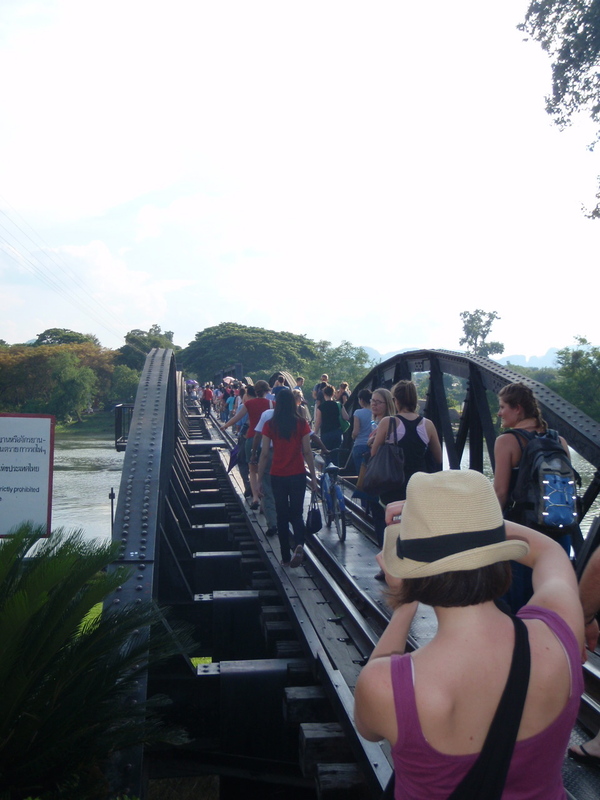 But the bridge has some interesting history that you should look up, to do with how it was built during WWII by POWs for Japan, thousands of which died during the construction/reconstruction (after the Allies bombed it). 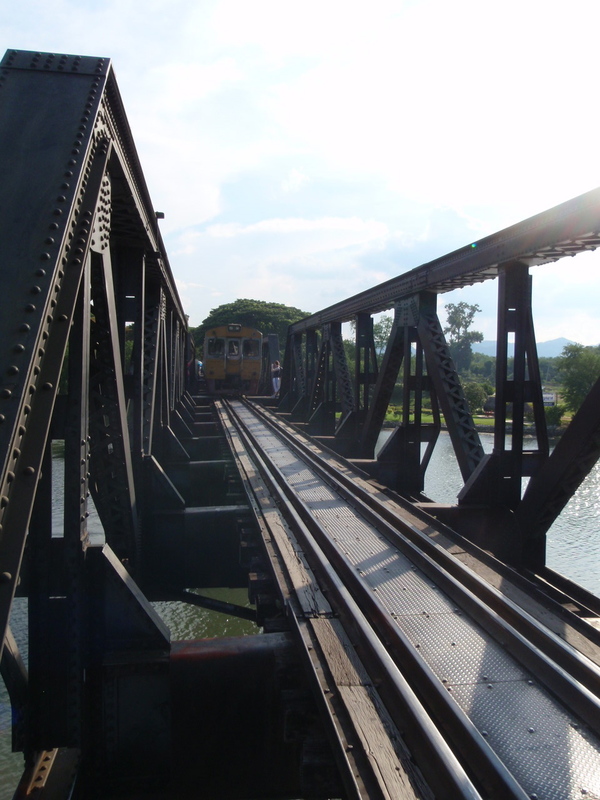 We almost got run over by a train, because we were not warned that the train tracks running along the bridge are still active! Luckily there’s little platforms along the bridge for pedestrians to cram onto to prevent death. How thoughtful. 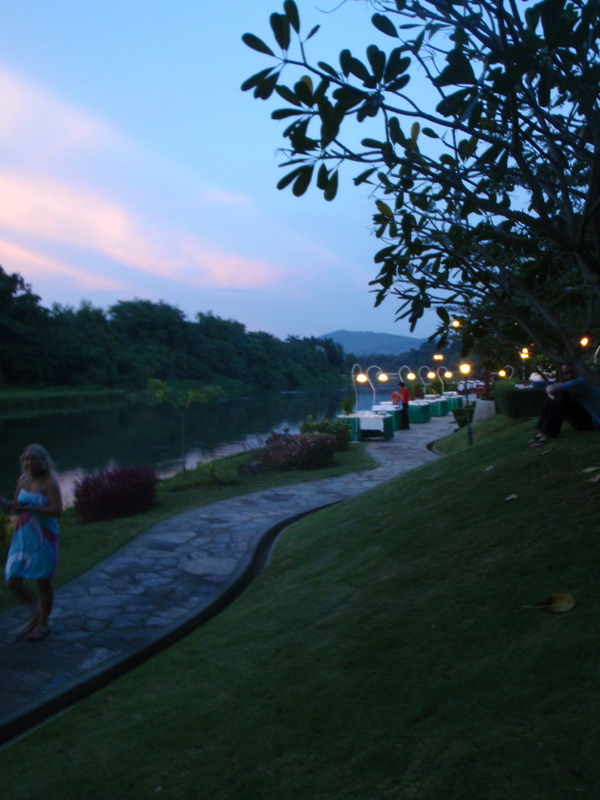 Our hotel, as I said was a paradise running along the river Kwai, where I enjoyed a fantastic Thai massage. It’s hard to describe the hotel without this getting too long and boring, but just think peaceful jungle paradise. The picture is of the river by our hotel. The lamps are where we ate dinner. 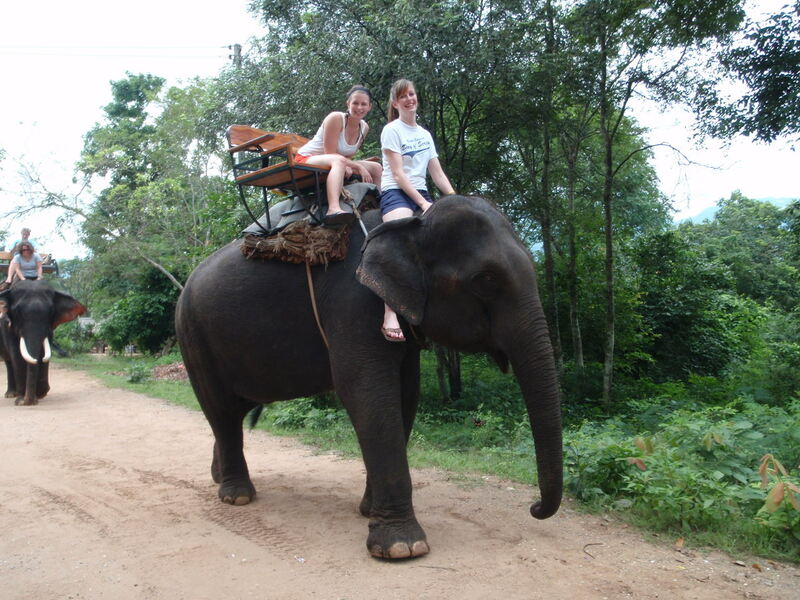 Lisa and I shared an elephant ride, which was great. I got to ride on the elephant’s neck! And they went walking into the river and through the jungle. 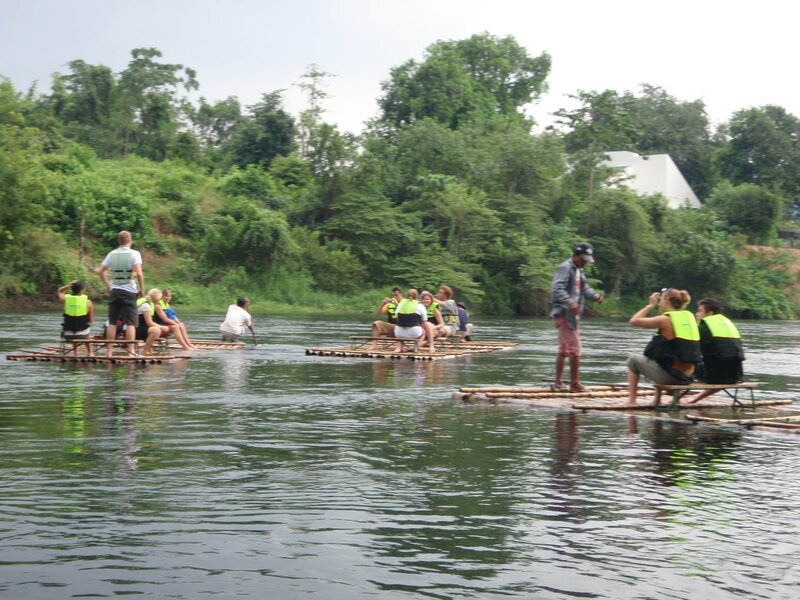 Then during our bamboo raft ride down the river, I actually spent most of the time swimming; so I get to say I’ve gone swimming in the River Kwai which at least my parents are exceptionally jealous of. 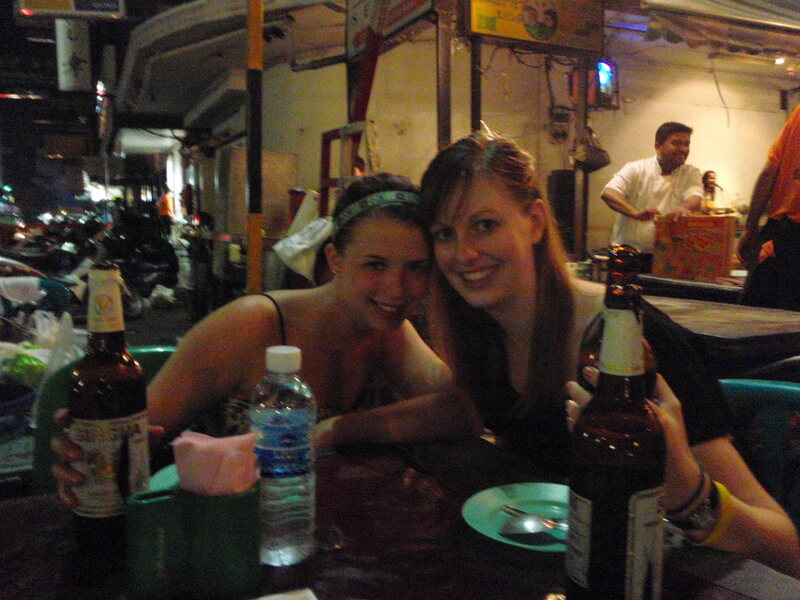 The bonus is that I haven’t been sick since this experience either, which is probably against all odds. That afternoon we went to visit an orphanage and teach a short English lesson. 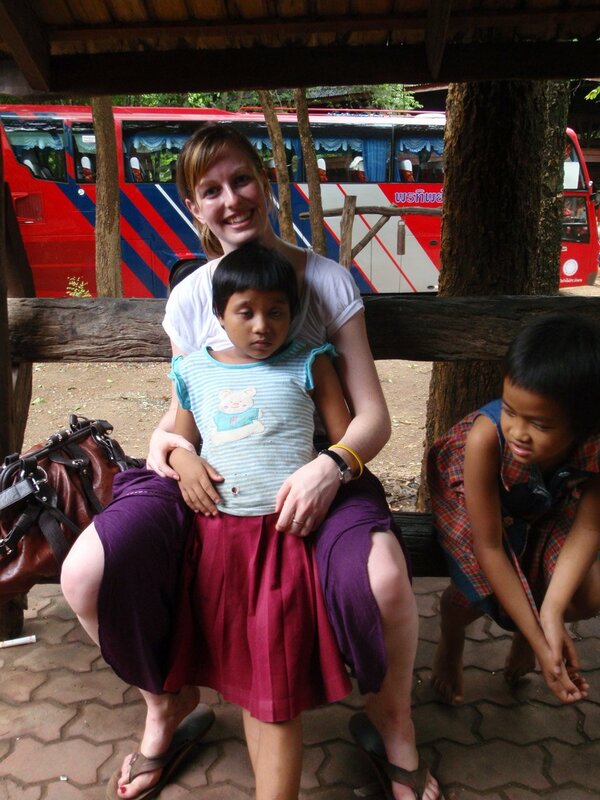 I left wanting to take every orphan home with me. 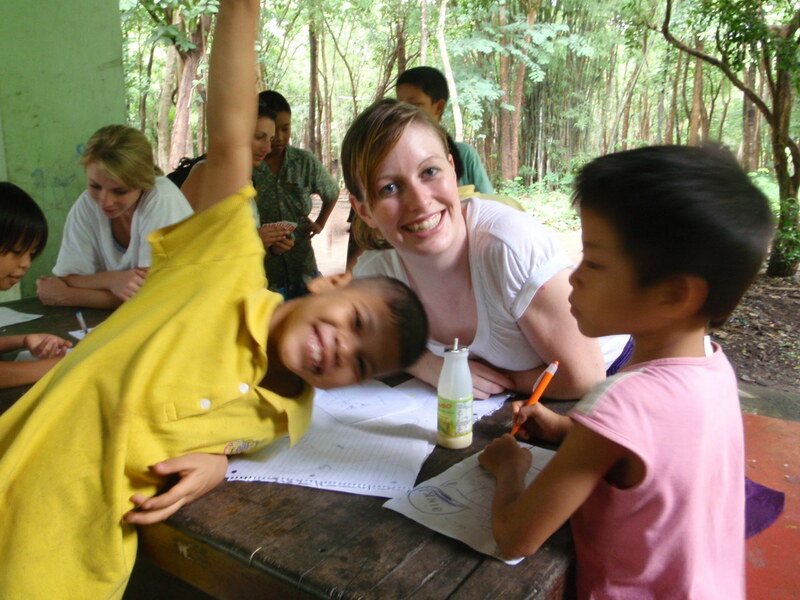 Thai children are irresistibly cute and they loved us. I spent about 45 minutes straight in the hot sun doing nothing but bumping kids up and down on my lap, which they never got sick of, even if I couldn’t feel my thighs afterwards. 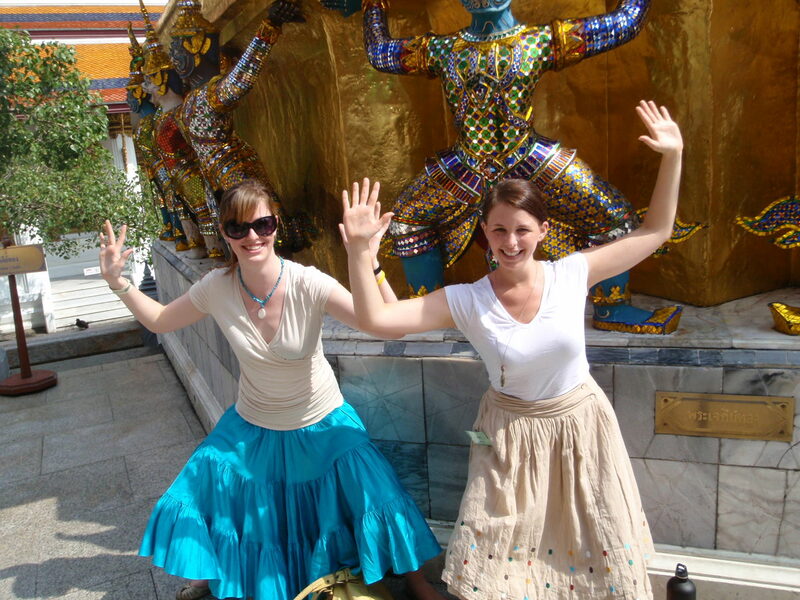 Finally, after a crazy Thai bus station experience, an 11-hour ride on a pretty amazing bus that had reclining seats, a stewardess, a hot meal at a random restaurant at 1:30am, and Thai karaoke music videos, Kelly, Shaleas and I have arrived in Tha Wang Pha. Our coordinators (Patarin and Amporn) met us and broke the news that we cannot move into our apartment yet and are stuck in a guesthouse for about two weeks (but who knows, on Thai time that could mean anything). Kelly and I are sharing a room that we have already had to rid of enormous spiders, a massive cockroach, and an ant infestation. But other than that….it’s still pretty annoying. The room is actually ok, it’s just frustrating since we have to continue living out of a suitcase, and school starts next week. Also, the shower is the bathroom. So each time we shower, the toilet, sink, and anything else in the bathroom gets soaked. But we have a Western toilet, which trust me is a blessing. 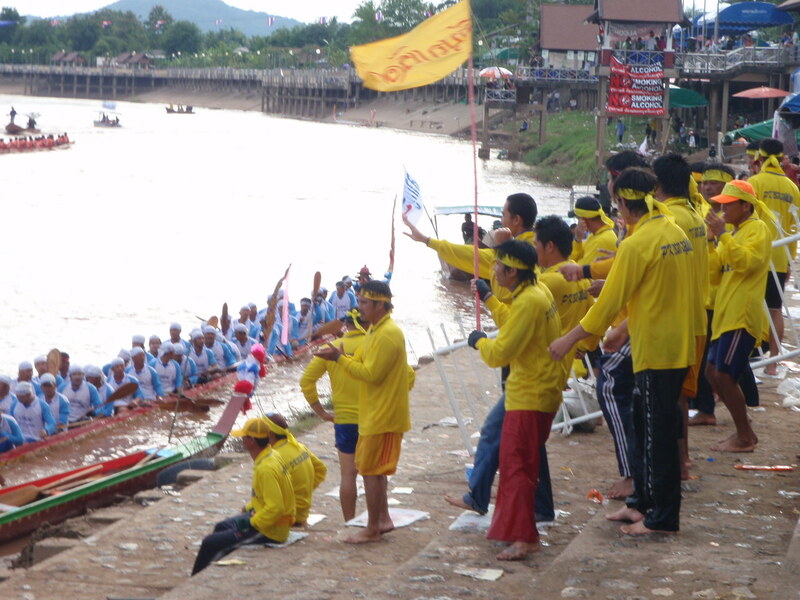 We saw the long boat racing in Nan on Sunday, which was fun. It’s one of the things this area is most known for, and we managed to catch the last day, which was lucky. We are clearly the only white people for miles because we get treated like celebrities everywhere we go. At the boat event several people took pictures of us, and one guy even videotaped us. 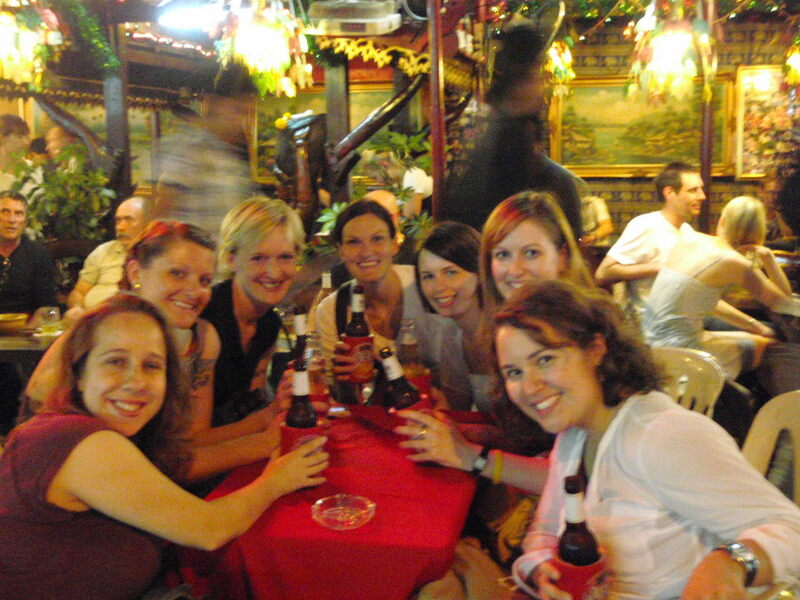 Everyone who can speak a little bit of English makes an effort to talk to us though, and last night we went out to dinner with Patarin, her husband and bunch of his friends who all had at least eight whiskeys each, and they spent the evening teaching us a lot of new Thai words, although I can’t remember most of them. I’m not sure if that’s because of the whiskey or the completely foreign language. We rode home sitting in the bed of Patarin’s pick-up which was amazing because the weather in the evenings up here is perfect, and the sky is full of stars, more than I’ve ever seen thanks to my city-dwelling life. There’s not much to see in the skies of London, New York, Baltimore or Boston I’m afraid. There’s a good market five minutes from our guesthouse, which we will be buying everything from toiletries, clothes, school supplies, and food from since we have no kitchen. It’s going to take a few days to adjust to this place, but all in all Tha Wang Pha is a really nice area, as is Nan (the main city, about half an hour drive from here). In order to get around, it’s becoming more and more clear that our only option is going to be renting or possibly buying motorbikes. 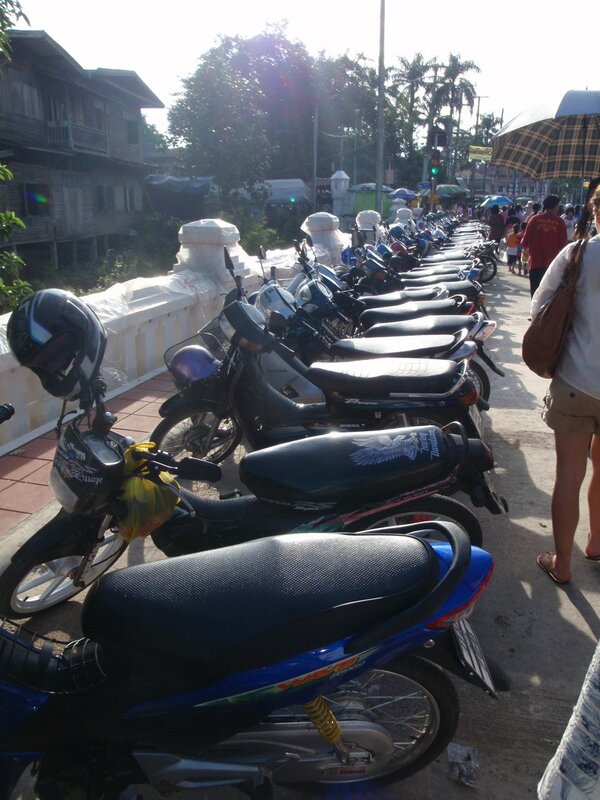 Absolutely everyone here has a motorbike of some sort, and the public transportation seems to be very sparse, if it exists at all, so we’ll be looking into that pretty soon. That’s it for now. 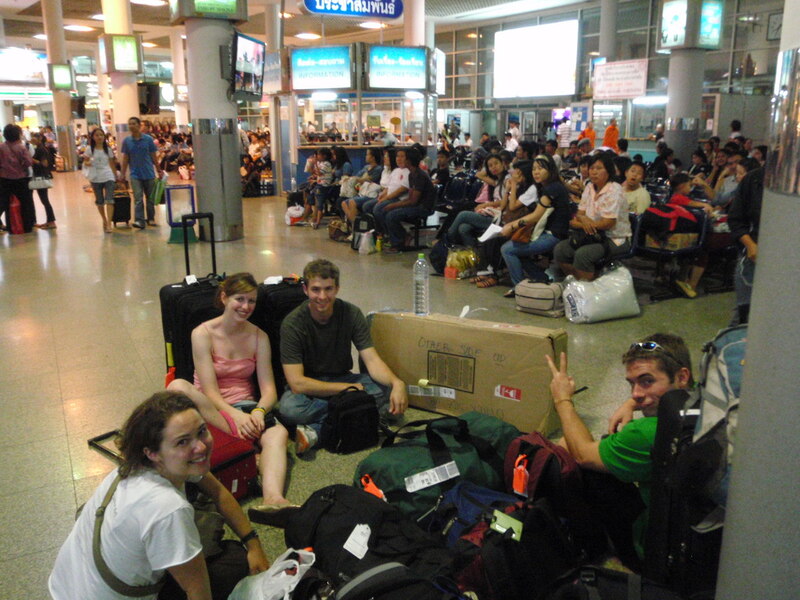 I’m here for a week, possibly going to Chang Mai for a couple of days if we can make it, and then school starts on November 3rd! I’ve already met one boy who goes to the school and also works in the market; he’s in the highest grade and spoke relatively fluent English so that’s a good sign! I’ve tried to post a few photos (hopefully it has worked!). There are a lot more, but I’m borrowing Kelly’s thumb drive to upload these at an internet café so the rest will have to wait I’m afraid. My future mode of transporation: literally everyone has one. Can’t wait until we can meet up! Great posting – great phots and loved hearing your news.